The Republic of Trinidad and Tobago is an island nation in the southeastern corner of the Caribbean Sea north of Venezuela's Orinoco Delta. Originally colonized by Spain, the islands were ceded to Britain in 1802 and united as a single colony in 1889. The country has been independent since 1962. Although often considered part of the West Indies, Trinidad and Tobago is actually on the South American continental shelf. Trinidad is much the larger of the two main islands and lies just off the Venezuelan coast; the smaller Tobago is about 50 km (30 mi) northeast of Trinidad. 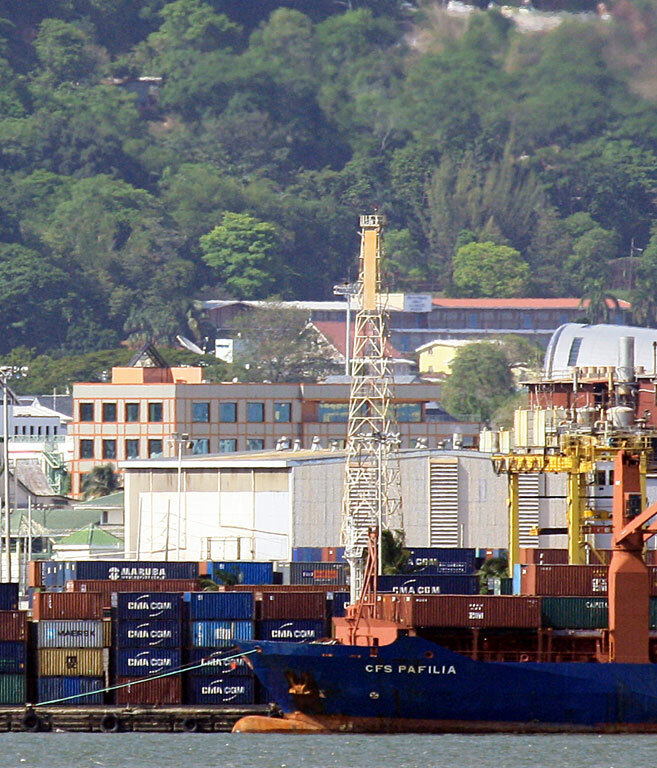 Port-of-Spain, on the west coast of Trinidad, is the capital and major port. 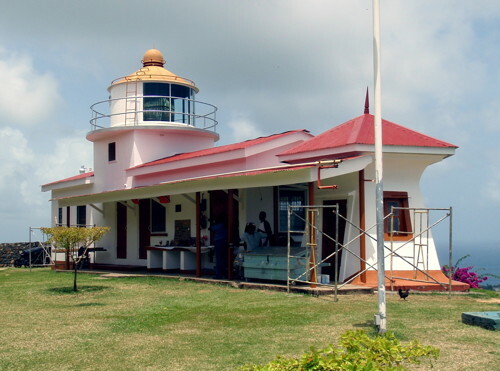 Only four of Trinidad and Tobago's traditional lighthouses survive. None of them are particularly well known, but in recent years they have begun to attract more attention from lighthouse fans. 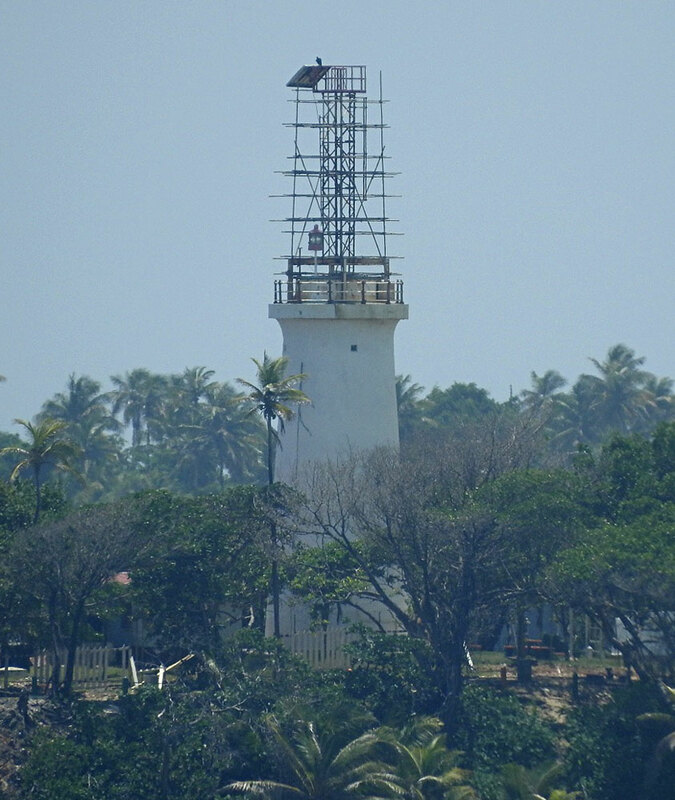 The active lighthouses are managed by the Maritime Services Division of the Ministry of Works and Transport. Photos by various photographers posted by Alexander Trabas; for this area the photos are mostly by Capt. Theo Hinrichs and Capt. Peter Mosselberger. Navigational chart information for Trinidad and Tobago. Date unknown (station established 1842). Active; focal plane 141 m (463 ft); two white flashes every 20 s. 7m (23 ft) pentagonal cylindrical concrete tower with round lantern and gallery, rising from the center of a 1-story concrete keeper's quarters; VRB-25 lens. Lighthouse painted white; the lantern roof and keeper's quarters roof are red. Susan Hunt's photo is above, Keith Rock has a 2005 closeup, Lightphotos.net has a closeup photo, Trabas has Douglas Cameron's distant view, Marinas.com has aerial photos, and Google has a street view and a satellite view. This lighthouse has been restored and appears to be in very good condition. 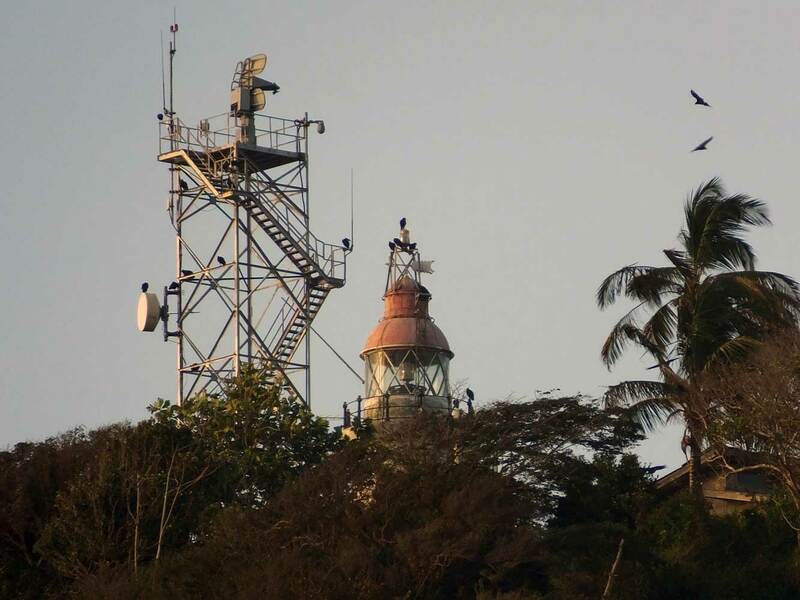 The lighthouse is located within the grounds of Fort King George, built in the 1770s; the fort is one of the best known historic sites of Tobago. According to research by Michel Forand, the original lighthouse was a pentagonal tower with a much lower focal plane of 39 m (128 ft), and in the mid 20th century the lighthouse was square rather than pentagonal. 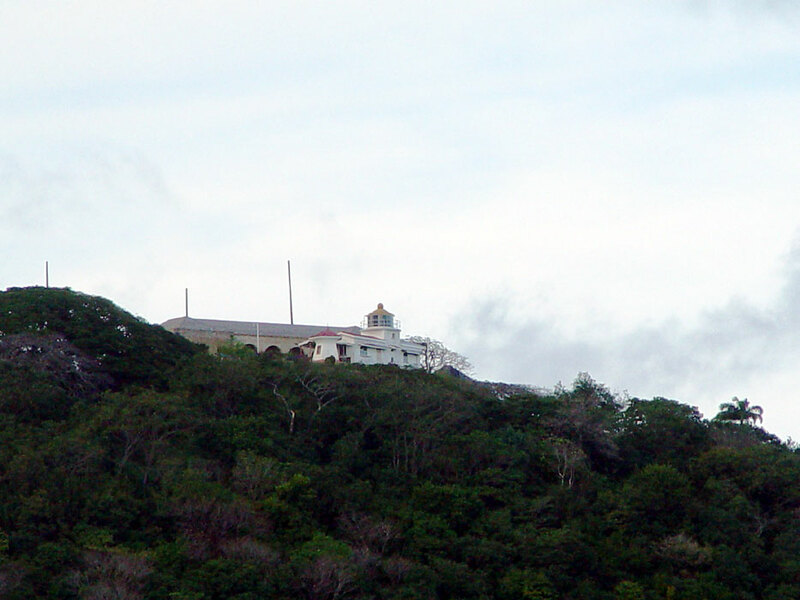 The fort and lighthouse are built on a hill commanding Bacolet Bay, the harbor of Scarborough, near the southwestern tip of Tobago. Site open (free), tower closed. Site manager: National Trust of Trinidad and Tobago. ARLHS TRI-003; Admiralty J5838; NGA 15184. Date unknown. Active; focal plane 15 m (49 ft); white, red or green light depending on direction, 1 s on, 1 s off. 12 m (39 ft) square white skeletal tower carrying a red slatted daymark. Lelord Cordel has a photo and Google has a satellite view. The range leads vessels into Scarborough. The rear light is on a similar but shorter tower on a hillside 244 m (800 ft) northwest. Located on Milford Road (the waterfront street) about three blocks west of the Port Authority terminal. Site open, tower closed. Admiralty J5839; NGA 15196. Date unknown. Active; focal plane 35 m (115 ft); four white flashes every 20 s. 26 m (85 ft) square white skeletal tower with gallery. No photo available but Google has an indistinct satellite view. Located at the southwestern tip of the island, adjacent to the runway of the international airport. Site and tower closed. ARLHS TRI-007; Admiralty J5841.5; NGA 15200. Date unknown. Active; focal plane 26 m (85 ft); white light, 7 s on, 3 s off; also a continuous red light. Approx. 24 m (79 ft) square skeletal tower, painted white. The tower also carries a vertical daymark painted orange. Trabas has a photo by Capt. Hinrichs showing both range lights and the shadow of the tower is seen in Google's satellite view. Located on the waterfront on the south side of Port-of-Spain. Site status unknown. Admiralty J5882; NGA 16197. Date unknown. Active; focal plane 26 m (85 ft); white flash every 2 s; also a continuous red light. Approx. 39 m (118 ft) square skeletal tower, painted white. The tower also carries a vertical daymark painted orange. Trabas has a photo by Capt. Hinrichs showing both range lights and Google has a satellite view. Located beside the Beetham Highway on the south side of Port-of-Spain. Site status unknown. Admiralty J5882.1; NGA 16197.1. Date unknown. Active; focal plane 41 m (135 ft); white light occulting once every 4 s seen along the range; also a continuous green light. Approx. 35 m (115 ft) square skeletal tower with gallery. The tower also carries a rectangular daymark painted in a red and white checkered pattern. Trabas has a photo by Capt. Hinrichs and Google has a satellite view. 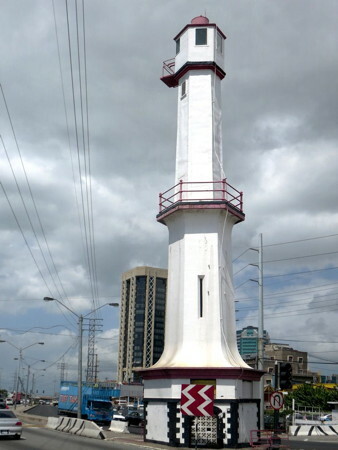 Located on the waterfront of Port-of-Spain's modern harbor, about 4 km (2.5 mi) southeast of the historic lighthouse. Site presumably open, tower closed. Admiralty J5884.24; NGA 16190. Date unknown. Active; focal plane approx. 50 m (164 ft); red light, 2 s on, 2 s off; also a continuous white light. Approx. 35 m (115 ft) square skeletal tower with gallery. The tower also carries a rectangular daymark painted orange. Trabas has a photo by Capt. Hinrichs and Google has a satellite view. Capt. Hinrichs found that this light has been relocated recently and light list descriptions are incorrect. Located about 400 m (1/4 mi) northeast of the front light. Site presumably open, tower closed. Admiralty J5884.25; NGA 16190.1. 1880s (station established 1841). Inactive. 19.5 m (64 ft) hexagonal tower with a small lantern at the top and a gallery in the middle, painted white with red and black trim. David Stanley's 2014 photo is at right, a June 2009 photo is available, Lightphotos.net has a 2012 photo, Lighthouse Digest has Sharon Arrindell's photo, and Google has a satellite view. According to Findlay's 1879 list the original lighthouse was also hexagonal but only 13 m (43 ft) tall. The lighthouse was built at the base of the St. Vincent Jetty, but since then the shoreline has been extended and the original purpose of the light has been lost. Huelse has a historic postcard view of the lighthouse in its original context. At some point (perhaps in the 1980s?) some restoration work was done on the tower, but by 2004 it was in poor condition with a lean of about 5°. In late 2005 the lighthouse was repainted in a wildly colorful pattern honoring Trinidad and Tobago's World Cup soccer team, and in late 2006 it was painted again to publicize the Cricket World Cup played in Trinidad in 2007. It still has the 5° lean. The lighthouse stands in the middle of a very busy downtown intersection. Located on Wrightson Road in downtown Port-of-Spain, the capital of the country. Site open, tower closed. Owner/site manager: Government of Trinidad and Tobago. ARLHS TRI-008. Note: The Dragon's Mouths (Bocas del Dragón) are the straits separating the northwestern corner of Trinidad from the tip of Venezuela's Paria Peninsula. The ridge of the peninsula continues across the strait to form the ridge along the north coast of Trinidad. Several islands in the strait also represent summits of the ridge. Date unknown. Active; focal plane about 65 m (215 ft); continuous red light. Approx. 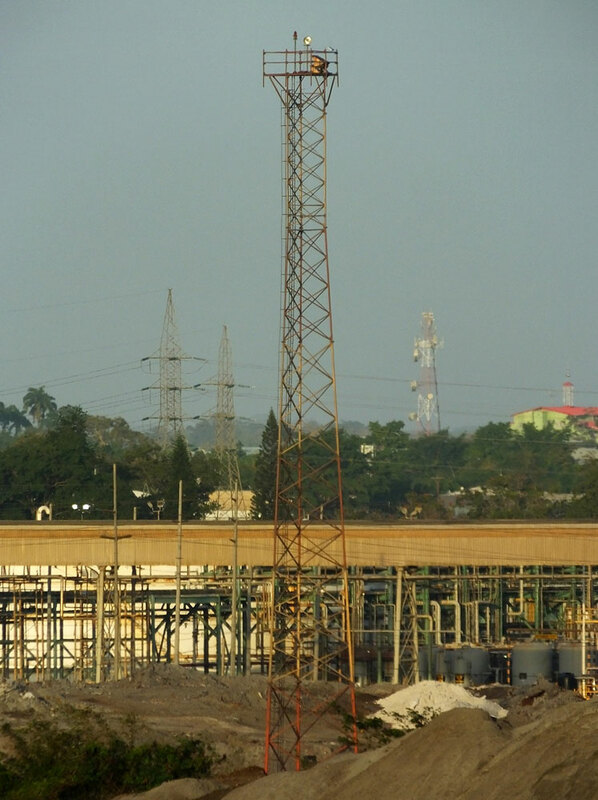 25 m (80 ft) square pyramidal skeletal communications tower. No photo available but Bing has a satellite view. Located on heights of the Point Gourde peninsula, which shelters Chaguaramas Bay, a very popular anchorage at the northwestern corner of Trinidad. Site status unknown. Admiralty J5860. Date unknown. Active (privately maintained and unofficial); white light, characteristic unknown. Approx. 20 m (66 ft) hexagonal wood tower with lantern and gallery centered on the roof a 1-story marina building. Tower painted white with narrow red spiral bands; lantern and gallery painted black. A 2011 photo is available and Google has a street view and an indistinct satellite view. 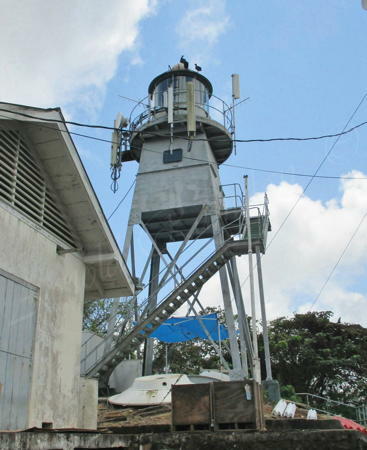 The lighthouse was built by Colin Barcant to help guide yachts into the docking area of Chaguaramas Bay. Site open, tower closed. Owner/site manager: Crew's Inn Hotel and Yachting Centre. Date unknown. Active; focal plane 13 m (42 ft); white flash every 4 s. 11 m (36 ft) square skeletal tower, painted white. No lantern. The tower is barely visible in a Google satellite view of the point. Located on the southwest point of Gaspar Grande Island, just off Chaguaramas Bay. Accessible only by boat. Site open, tower closed. Operator: Port Authority of Trinidad and Tobago. ARLHS TRI-009; Admiralty J5856; NGA 16236. 1897. 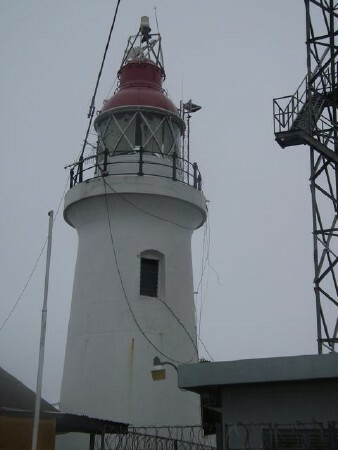 Active; focal plane 251 m (825 ft); white flash every 10 s. 15 m (49 ft) round tower with lantern and gallery, painted white, lantern red. The original Fresnel lens, removed in 2007, was unfortunately broken while being transported to Port-of-Spain. A photo by Rory and Bunty O'Connor is at right, Amrit Ramoutar has a 2014 photo, another good photo and a 2008 photo are available, Trabas has Capt. Peter' photo, a 360° view from the gallery is available, Huelse has a historic postcard view, and Google has a satellite view. The lighthouse, one of the highest in the Americas, is built atop a steep mountain with a spectacular view of the Dragon's Mouth. The island, site of a leper colony from 1922 to 1948, is now uninhabited except for periodic visits from the lighthouse service staff. Located on the island of Chacachacare on the east side of Boca Grande, the widest Dragon's Mouth strait, off the northwesternmost tip of Trinidad. Accessible only by boat; tours available from Chaguaramas. Site open, tower open by arrangement with the keepers. Owner: Government of Trinidad and Tobago. Site manager: Chaguaramas National Park. ARLHS TRI-002; Admiralty J5846; NGA 16256. Date unknown. Active; focal plane 228 m (748 ft); white flash every 5 s. Approx. 10 m (33 ft) mast. No photo available but Google has a satellite view. Located atop a summit on the north coast of Trinidad north of Diego Martin. Accessible by road. Site appears open, tower closed. Admiralty J5844; NGA 16264. Date unknown. Active; focal plane 99 m (325 ft); two white flashes every 10 s. Approx. 15 m (49 ft) square skeletal tower with gallery. Kurleigh Martin has a 2015 photo and Google has a satellite view. Located on a prominent headland at Fort Abercrombie on the north coast of Trinidad, about 7 km (4 mi) northeast of Las Cuevas. Site status unknown. Admiralty J5843; NGA 16264.7. 1897. Active; focal plane 43 m (141 ft); white light, 6 s on, 4 s off. Approx. 12 m (40 ft) masonry tower with gallery; the lantern has been removed and replaced with a square skeletal tower raising the total height to 23 m (75 ft). Lighthouse painted white with red trim; the skeletal tower is painted with red and white horizontal bands. 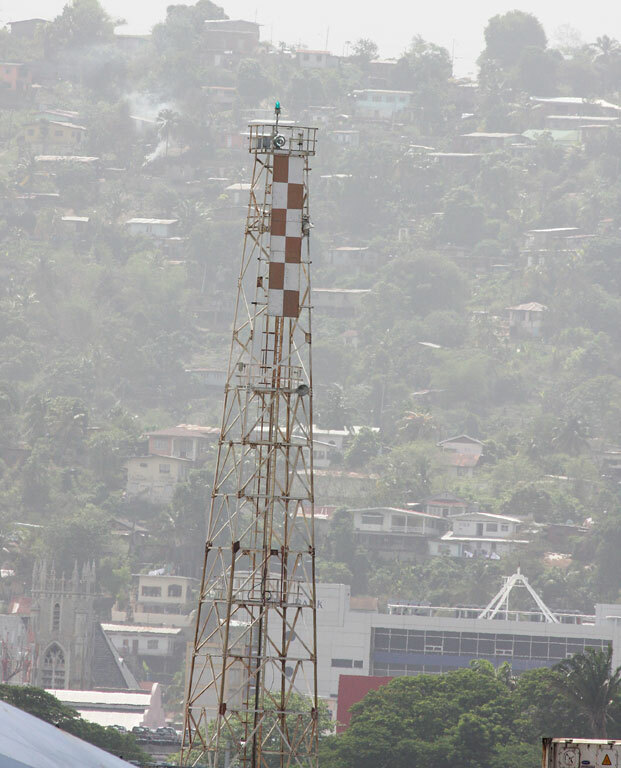 The University of the West Indies maintains weather and air monitoring equipment also mounted on the skeletal tower. A 2011 photo is at right, the National Trust has a page for the lighthouse, Othmar Raoul Traninger has a good 2007 photo, Lightphotos.net has a good photo, Wikimedia has a 2009 photo, a 2008 photo is available, Trabas has a distant view by Capt. Hinrichs, and Google has a satellite view and a street view from the beach below the light station. After being neglected for many years the lighthouse was restored and repainted in 2006-07. In 2011 there was additional restoration, a parking lot for visitors was completed, and the lighthouse was staffed by security guards to protect visitors and prevent vandalism. Located at the northeastern tip of Trinidad, east of Toco. Site open, tower open by arrangement with the staff. Owner/site manager: Government of Trinidad and Tobago. ARLHS TRI-004; Admiralty J5842; NGA 16266. 1958. Active; focal plane 217 m (712 ft); three white flashes every 30 s, in an unusual pattern: first two flashes separated by 3 s, second and third by 12 s. 11 m (36 ft) square pyramidal skeletal tower with lantern, gallery, and enclosed watch room. Lighthouse painted white. Arnie Ram's photo is below right, Anne Acosta has a good photo and Google has a satellite view. The lighthouse shares the site with a large TV/radio transmission facility. The view from the gallery is said to be spectacular. Located on a ridgetop on the east side of Trinidad, overlooking the Atlantic. Site and tower open. Owner/site manager: Government of Trinidad and Tobago. ARLHS TRI-001; Admiralty J5915; NGA 16108. Date unknown. Active; focal plane 87 m (285 ft); white flash every 5 s. 9 m (30 ft) skeletal tower, painted white. No photo available but Bing has an indistinct satellite view. A photo of the north side of the hill shows some of the neighboring petroleum facilities. Located on a high headland at the southeastern tip of Trinidad. Site status unknown. Admiralty J5914; NGA 16109. Date unknown. Active; focal plane 45 m (148 ft); four white flashes every 20 s. Approx. 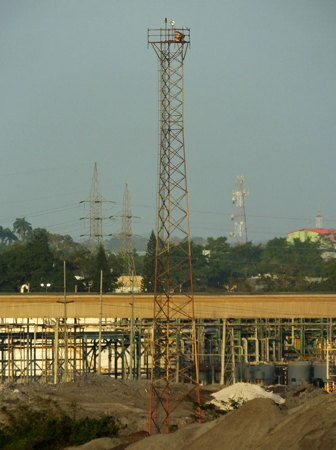 30 m (98 ft) square cylindrical skeletal tower. The tower is behind the church in Orlando Pyle's photo and Google has an indistinct satellite view. Located in Moruga, a village on the central south coast of Trinidad. Site status unknown. Admiralty J5913.5; NGA 16110. Note: The 60 km (37 mi) long Siparia peninsula frames the south end of the Gulf of Paria. At its end, the 16 km (10 mi) wide strait of the Serpent's Mouth separates Trinidad from the Orinoco delta region of Venezuela. Date unknown. Active; focal plane 69 m (226 ft); three white flashes every 15 s. NGA has no description of this light and the light is not seen in Google's satellite view of the point. Located on a headland on the south side of the Siparia peninsula, near San Francique. Site status unknown. Admiralty J5913.4; NGA 16111. Date unknown (station established 1870). Active; focal plane 22 m (72 ft); white flash every 7.5 s. Approx. 18 m (56 ft) skeletal tower, painted white. No photo available but Google has a satellite view. This lighthouse guides vessels through the Serpent's Mouth strait. The original light was shown from a mast at a focal plane of 12 m (39 ft). Located at the tip of the Cedros Peninsula, which is the extreme southwestern tip of Trinidad. Site status unknown. Admiralty J5912; NGA 16116. Date unknown. Active; focal plane about 40 m (131 ft); white flash every 10 s. Approx 5 m (17 ft) round concrete post. Two views from the sea are available and Bing has a satellite view. Soldado (Soldier's) Rock is the larger of two rocks rising dangerously near the center of the Serpent's Mouth strait off the Punta del Arenal. The rocks were formerly claimed by Venezuela, but the 1942 border treaty placed them in Trinidad and Tobago. The rocks are a protected wildlife reserve. Site and tower closed. Admiralty J5909.5; NGA 16118. Date unknown. 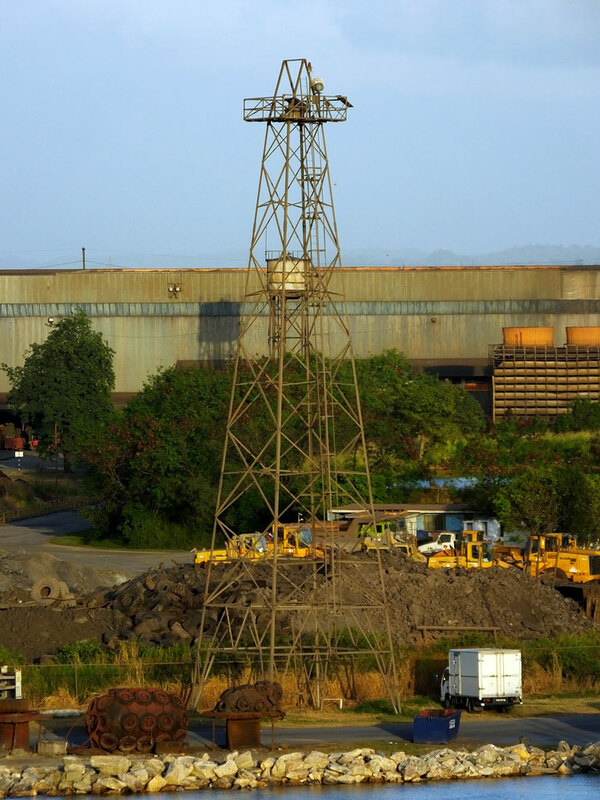 Active; focal plane 30 m (98 ft); two white flashes every 10 s. 24 m (79 ft) aluminum skeletal tower. No photo available and the tower is inconspicuous in Bing's satellite view. 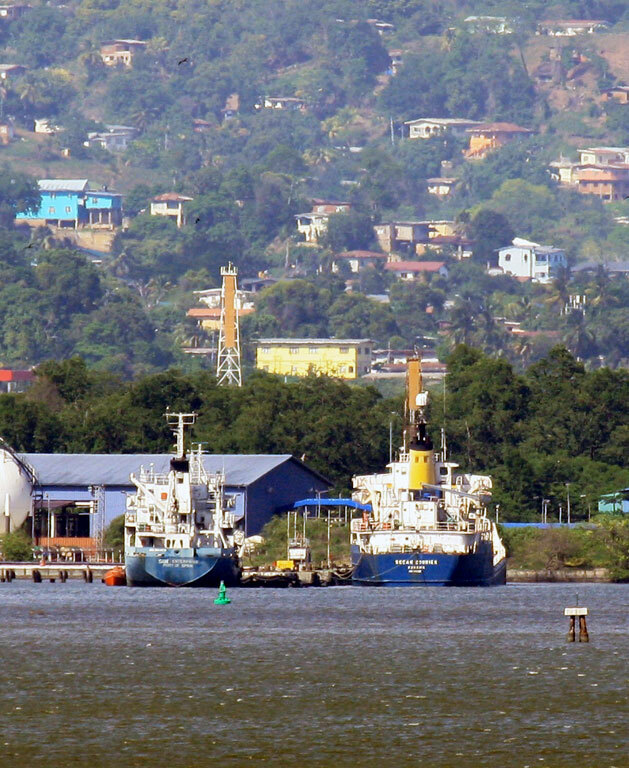 Point Fortin is a former oil port that now handles liquified natural gas. Located at the end of a jetty about 4 km (2.5 mi) long that delivers liquified natural gas to waiting tankers. Site and tower closed. Owner/site manager: Atlantic LNG. Admiralty J5908; NGA 16132. Date unknown. Active; focal plane 32 m (105 ft); green flash every 3 s. 28 m (92 ft) skeletal tower carrying a daymark painted red with a yellow vertical stripe. No photo available but Google has a satellite view. Located on the waterfront at Point Fortin. Site and tower closed. Owner/site manager: Atlantic LNG. Admiralty J5908.7; NGA 16134. Date unknown. Active; focal plane 32 m (105 ft); green flash every 3 s. 28 m (92 ft) skeletal tower carrying a daymark painted red with a yellow vertical stripe. No photo available but Google has a satellite view. Located 300 m (330 yd) southeast of the front light. Site and tower closed. Owner/site manager: Atlantic LNG. Admiralty J5908.71; NGA 16134.5. Date unknown. Active; focal plane 16 m (52 ft); three white flashes every 10 s. 12 m (39 ft) square cylindrical skeletal tower. No photo available but Google has a satellite view. 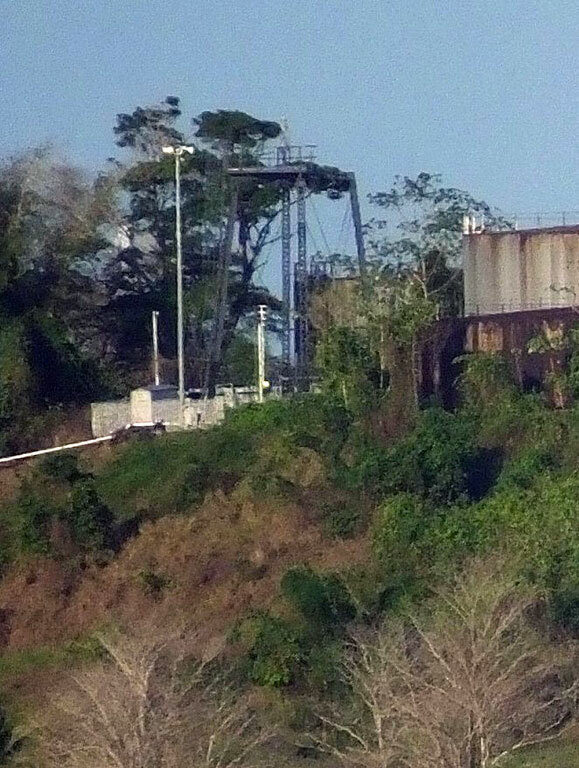 The rear light is on a much shorter tower on the hillside behind the port. Located on the industrial quay at La Brea. Site and tower closed. Admiralty J5903; NGA 16140. Date unknown. Active; focal plane 71 m (233 ft); quick white flash every 2.5 s. Approx. 20 m (66 ft) square platform supported by four steel legs. Trabas has Capt. Peter's photo and Bing has an indistinct satellite view. Located high on a bluff overlooking Pointe à Pierre, a town surrounding the Petroprin oil refinery. Site status unknown. Admiralty J5895; NGA 16152. Date unknown. Active; focal plane 30 m (98 ft); white flash every 2 s, synchronized with the rear light. Approx. 27 m (89 ft) square pyramidal skeletal tower with gallery, painted black. Trabas has Capt. Peter's photo and Bing has an indistinct satellite view. Savonetta is an industrial port on the central west coast of Trinidad, facing the Gulf of Paria. Located close to the waterfront at Savonetta. Site status unknown. Admiralty J5891; NGA 16180. Date unknown. Active; focal plane 41 m (135 ft); white flash every 2 s, synchronized with the front light. Approx. 35 m (115 ft) triangular skeletal tower with gallery. Trabas has Capt. Peter's photo (also seen at right) and Bing has an indistinct satellite view. Located within the industrial area 700 m (0.44 mi) northeast of the front light. Site status unknown. Admiralty J5891.1; NGA 16184. Posted March 31, 2005. Checked and revised March 19, 2019. Lighthouses: 26. Site copyright 2019 Russ Rowlett and the University of North Carolina at Chapel Hill.